UPM's Sari Mannonen (second from right) was on hand to receive the Bioenergy Industry Leader Award. Finnish company UPM Biofuels has been recognised for its bioenergy industry leadership at the 2017 Platts Global Energy Awards in New York City. Staged for the 19th occasion, the annual competition acknowledged the top performers, industry leaders and innovators in the global energy business. Such is the clout of the awards that they are often described as the ‘Oscars of the energy industry’. UPM Biofuels was nominated for its wood-based low emission advanced UPM BioVerno biofuels, and its commercial scale biorefinery in Lappeenranta. The Finnish company was chosen as the ‘Bioenergy Industry Leader’ from a pool of companies which have developed sustainable bioenergy solutions. These included DuPont Industrial Biosciences, Praj Industries, Propel Fuels, Targray and Alcol Biotech. 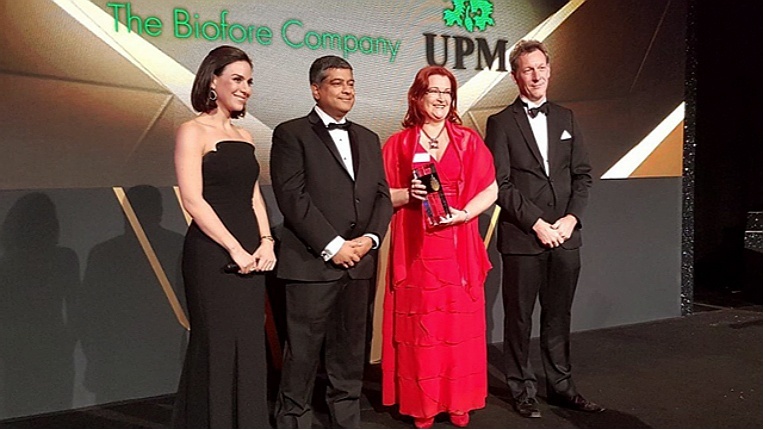 UPM Biofuels won praise for its commitment to sustainability and ability to utilise forest industry residue as a raw material for its advanced biofuels production.